The tile of today’s post is the same as the new book by the National Association of Scholar’s Rachelle Peterson and Peter Wood, released yesterday and which can be downloaded by all and one. I’ll later review that book, but today a report on the NAS’s conference on the same topic held in the darkening shadow of the United Nations Tuesday. Your Roving Reporter was there. Peter Wood is also President of the NAS and was master of ceremonies. Woods forte is the joke most subtle. He said the fight against rising ocean levels was foreseen by Hamlet (“…to take arms against a sea of troubles…”). Anyway, Wood said the sustainability movement got started when college presidents were lured into signing the President’s Climate Commitment, a device which elites use to signal to other elites their devotion to all things progressive. This document is usually signed by college leaders in absence of any meddling from actual professors, who might damper ardors, particularly on matters scientific. The American Enterprise Institute was represented by their boss, Arthur Brooks, who reminded us of Bach’s answer to the question “Why do you do write music?”. Bach said, “For the glory of God and the good of mankind.” Brooks also rightly said that since around 1970 the percent of folks living in abject, starvation-level poverty has declined by some 80% because of capitalism and adherence the rule of law. Yet, strangely, both principles are under attack. His advice to fight the rising tide of progressivism was not to fight against things, but to fight for people. It was his opinion, shared by most of the room, that the Republicans never lost their minority mindset. That’s partly true, but it’s better to say that Republicans are the party of slightly smaller government. He mentioned some universities have banned trays in student cafeterias or have otherwise annoyed them with other trivial save-the-earth actions. Why? To make students pay a “psychological sustainability tax.” Nudging students, the favorite buzz phrase, is thought superior to old-fashioned indoctrination. Sp!ked magazine was there. Have you never see it? I recommend their Frank Furedi. Editor Neil Ross spoke. He said the magazine believes “Western Enlightenment ideals are worth standing up for.” Perhaps they are, but it’s those ideals that have caused (or are) progressivism, so it’s not clear what standing up for them would do. Ross was also against nudging: “Leave students to make their own decisions.” Also good, to an extent. Students making their own decisions in ignorance, say in picking what to study, has not led to improvements in universities. Yet Ross was spot on when he said that those who would nudge think they can perfect the species through science. This is scientism. Finally, the star of the show, because she was the main author, Rachelle Peterson. She emphasized “sustainability” had two meanings: “wise maintenance of a grand inheritance” or “desperate survival [in the face of looming apocalypse]”. Guess which ones colleges have chosen? She said the endless elbows in the ribs policies were designed to produce “socially optimal behavior”. Colleges now have “eco reps” who have the job of “shaming students” into doing what elites want them to. That raging “eco-morality” produces inconvenience nobody disputes. But what’s less understood is that inconveniences are a “primary goal”. “Deprivation” is seen as a good. I asked Peterson what were the main drivers of sustainability. Besides those mentioned, she thought identification with progressive social goals was the strongest incentive. This seems true because throwing a scientific fact, more matter how solid or how forcefully hurled, against an sustainability activist never leaves a mark. Good science bounces right off of them. I would love to see the term “progressive” dropped and “Regressive” adopted. Much more apt, don’t you think. No sarcasm intended, btw. My suggestion may have ad hom overtones, but there is nothing at all progressive about turning back the clock. 2) engage in pointless, but sometimes amusing debate. I am glad that such words have been adopted by certain types as it makes my life more efficient. Management speak serves a similar function. You wouldn’t last long on a desert island. I spent years living on a desert island in the south Atlantic, Ascension Island. Life would have been unsustainable without diesel powered generators providing power for the desalinization plant. The nearest other island was St. Helena, the retirement home of Napoleon. Students need the confidence to stand up and be vocal against this type of enforcement. I always was. Although what was being enforced back in the ’80’s is different from what is being enforced today. I always made it a point to counter-educate such individuals, which occasionally included a few lecturers with doctorates. My estimates were that 30% of the student body were indoctrinated and vocal about toeing the line. The remainder went along with the trend as they felt it wasn’t worth the angst. The indoctrinated while vocal were highly inarticulate and could never explain why they believed what they believed, at least on rational grounds. It was more of a feel good moral exercise for these proto-puritans and they always looked like rabbits gazing into on coming traffic when confronted. They were just shocked that anyone would dare question their world view. For some reason it made me popular. I couldn’t get from one class to the next at university without a half dozen people stopping to say “Hi Will, how’s it going!” in a friendly way. I never knew the names of most of these students who were always smiling and saying hello. Global warming is losing steam, and “sustainability” is a perfect replacement. To be “sustainable” is a highly personal thing, whereas to “fight” global warming only took the time to attend an organized march or two a year or sign the odd online petition (to demand the firing of a respected scientist) or to make an ill-informed comment on a news story or blog post. The real test to see if sustainability sticks post-graduation–when graduates have the means to buy a little comfort, will they? We applied sustainable forestry in this country years ago and it’s actually worked out quite well. I’m not sure what the problem is here. What’s wrong with the concept of “sustainability?” You’d think Americans, of all people, what with the bootstraps and all, would be all for sustainability! Are you guys just reflexively against anything that seems “left” to you? Sustainability as a theme posits the the notion that there are a limited number of “things” in the world. These cannot be replaced, so must be rationed. Or preferably, not consumed at all. For example, we must not burn coal because that is not sustainable. In a few thousand years we might run out, so we had better stop burning it now. Or the concept of recycling where recycling becomes a feel-good notion that makes no economic sense, and may in fact consume more resources than it attempts to save. It is economical to recycle some goods but certainly not everything that can potentially be recycled. Ultimately critics of sustainability are usually critical of an anti-capitalist or anti-economic growth agenda (i.e., pro-poverty) wrapped around a friendly sounding word. As with reducing pollution where possible, it seems to me if the benefit of utilizing more sustainable resources outweighs the cost, then it should be done. We’ve cleaned up our environment, here in America, dramatically, though deindustrialization should be noted here, in the last half-century. We should be looking at ways to be more energy efficient as well. We can do it. The problem here is that we have an energy sector that operates like little fiefdoms all around the country. They have every motive to keep supply limited and expensive, and usage up. People like the inconspicuously named National Association of Scholars would have you ignore that reality. We Americans have every motive to push for more diversity of supply. Tesla are talking about introducing a battery pack for the home. So you can cover your roof tiles in solar panels and plug it into the battery and get off the grid that way. Won’t likely leave much change after spending 20K but at least Jersey McJones can stick it to those greedy energy companies, and will be laughing all the way to the bank assuming he lives to the age of 130 and he doesn’t have to replace his battery pack too many times. The main thing is about sticking it to the man. I have no issues at all with correct usage of the word sustainability. The problem is that eco-loons have jumped on the bandwagon and assimilated the word to defend all kinds of hair-brained ideas. Some are cited above. In most cases I find people using the word have no idea what it means, and know even less about how the world really operates. Where I come from, which is Australia, different states have very different energy policies. Victoria, for example, has its energy supply privatized. New South Wales, on the other hand, have their electricity supply run by the government. (Jersey’s dream come true.) So guess who pays the higher energy bills? How is that sustainable, JMJ? JMJ may applaud that those dirty nasty capitalists have lost all that money – but how much of that money belonged to the German people? Sustainability has no clear definition. It is a word that remains deliberately vague so as to be wonderful for advertising to people who emote, not think, and to beat people over the head with it if you don’t like what they are doing. If it were clearly defined, it would be dropped and replace with an equally vague term. “Renewable energy” is one such proof that sustainability is a random term used to beat opponent over the head. The fuel may be free, but since the wind and sun refuse to just convert themselves to electricity and upload to the grid, there is massive damage done building and installing facilities that produce little. However, it’s “free fuel”. Only a devoted believer or a complete scam artist fails to see this reality and there are plenty of both out there. So massive ecological damage is done, none of which is in any way sustainable, in the name of sustainability. There is no diversity of supply in energy–there is nuclear, oil, natural gas and hydro. All others are antiquated failures that are being foisted upon people. Sheri, it’s thinking like yours that stifles innovation. I would welcome competitive renewables, but we are a long way from that reality. Happy for governments to fund further research, of course. Forcing renewables before they are competitive leaves us all poorer. JMJ: Could you be more cryptic if you tried? Some talking points, please. Of course you could be right to some degree–you seem to have no actual comebacks or explanations. Perhaps I intimidate you? Guess my thinking stifled JMJ….. 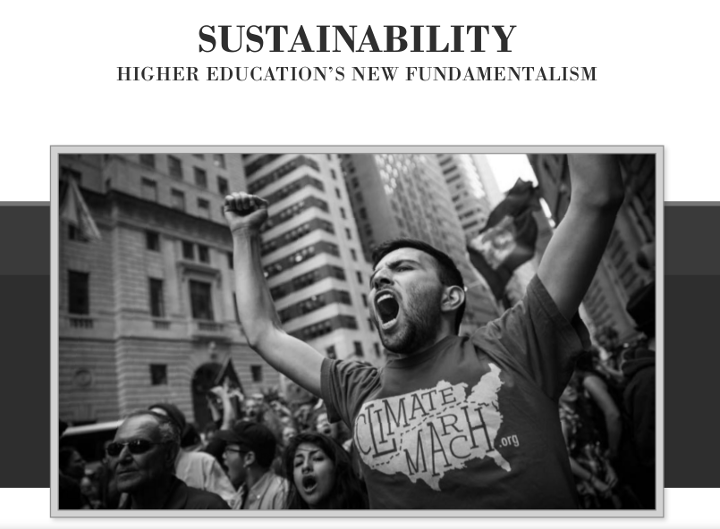 I applaud the effort of Peter Woods and Rachelle Peterson to reveal higher education’s indoctrination of our youth into the postmodern progressive, collectivist mindset. The current administration is supporting such programs through grant-funded university research projects. In addition, it is funding state and local government sustainability initiatives to ensure that certain “moral” choices are reduced to legal requirements by means of business practices and municipal codes. A forthcoming law review article (url above) entitled, “Local Sustainability Movement Rides Wave of Evolving Federalism to ‘Axe’ Private Property Rights” examines Obama administration sustainability initiatives and surveys U.S. Supreme Court federalism jurisprudence in an effort to explain how this White House has exploited the Court’s evolving anti-New Deal Federalism to facilitate and accommodate post-modern environmental & social sustainability initiatives at the U.S. state and local levels that attenuate private property rights and subjugate them to putative public interests.